With its GT3 nose, today’s Nice Price or Crack Pipe Cayman certainly has it on the aggressive good looks front. Let’s see if those are backed up with an equally aggressive asking price. It has been said that with great power comes even greater responsibility. That makes a lot of sense to me, but also causes me to wonder—shouldn’t those with little or no power be held to similar obligations? Yesterday’s 1990 Subaru Justy AWD had very little power to wield, but it remained responsible for living up to a $5,300 asking price its seller had set. Sadly, 68 percent of you felt it failed that committal, with many of the comments saying it looked to be about thirteen-hundred too dear to avoid that Crack Pipe loss. Let’s talk about elephants for a second, specifically, the elephant’s nose. Unique among surviving megafauna, the pachyderm’s nose has evolved into an elongated multitasking appendage useful for carrying food into the animal’s mouth, spraying water or clumps of dirt onto its back, and for making elephants undenia bly adorable. With over 1,948 olfactory receptor genes, the African Elephant is also considered to be one of the keenest smelling animals known to man. I’d just like to use that new-found knowledge to point out that the nose on this 2007 Porsche Cayman is also extremely interesting. The Cayman, as we all know, is Porsche’s could-be-better-than-the-911-but-we-won’t-let-it car. With its mid-engine placement and torsionally rigid body, the Cayman has always been the Dash Incredible of Porsche’s lineup, held back by the company lest it outshine its bigger brother, the venerable 911. This one is attempting to sneak one by us all by adopting a 911 GTR nose, and I must say, it’s working. 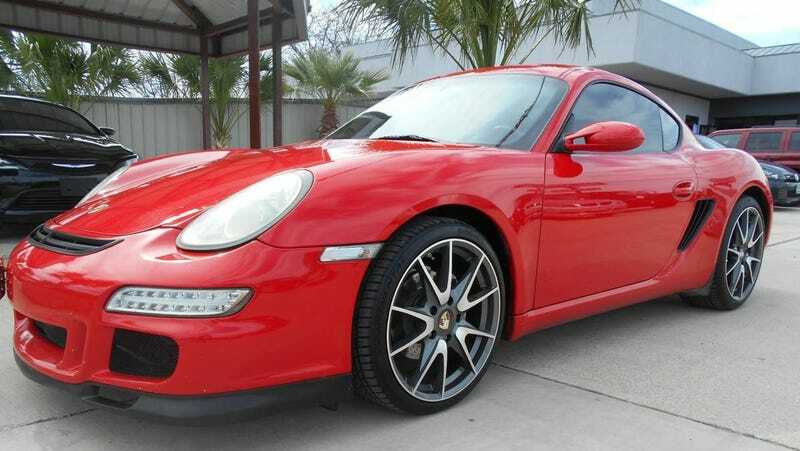 The dealer offering this Guards Red over black leather custom Cayman doesn’t give any description at all, either in its Craigslist ad, nor on their podunk dealership Web site. They do provide the VIN, and a quick search of that reveals some interesting intel. According to that, the car came out of its Finnish factory (the Caymans of this era were all built by Valmet Automotive in Uusikaupunki) in October of 2006. The original manufacturer price was $52,800, and it came lightly optioned with just some comfort and convenience accoutrements added to it out of the gate. At some point however, the car also gained its long, GT3-aping nose. There is a company in Danbury, Connecticut, Farnbacher Loles Motorsports, that mods Caymans in this way. Their cars generally put some meat behind the potatoes too, adding massaged suspensions and drivetrain improvements to the visuals. This one however, appears stock save for the schnoz. That means a base 2.7-litre, 245 horsepower flat six and just five forward cogs in the gearbox behind that. That’s all okay though because even a base Cayman is going to be better than most everything else you might find out there at a similar asking. If we’re down with the car, then let’s get on to the specifics. There’s 131,000 miles on the clock here, and that pointy proboscis shows them with a light peppering in the paint. The headlights also exhibit a bit of hazing but nothing untoward. The rest of the bodywork looks clean and the paint appears in terrific shape extant of that spiced nose. The interior seems to have lasted the past decade-plus without much complaint as well. There is some wear obvious on the hard surfaces, and this being an ’07, the dash is appreciably old school. It lacks a big screen in the center stack or a place to put your phone other than an aftermarket cradle. You’ll get over that however, once you discover that the ignition is on the left, just as it should be. There is no mention of the mechanicals in the ad either, but there doesn’t seem to be any rivulets of fluid coursing out underneath the car in any of the pics so we can assume it’s all reasonably a-okay under the hatch. Of course things like brakes, tires and other consumables might be deemed in need of replacement once a closer inspection has been made. If you’re making that close of an inspection then you’re no doubt doing so in full awareness of the car’s $17,999 asking price. Now that we’re all aware of it, let’s make some choices as to its appropriateness. What’s your take on this nosy Cayman and that $17,999 price? Does that make for the sweet smell of success for the seller? Or, does that price funk it all up? 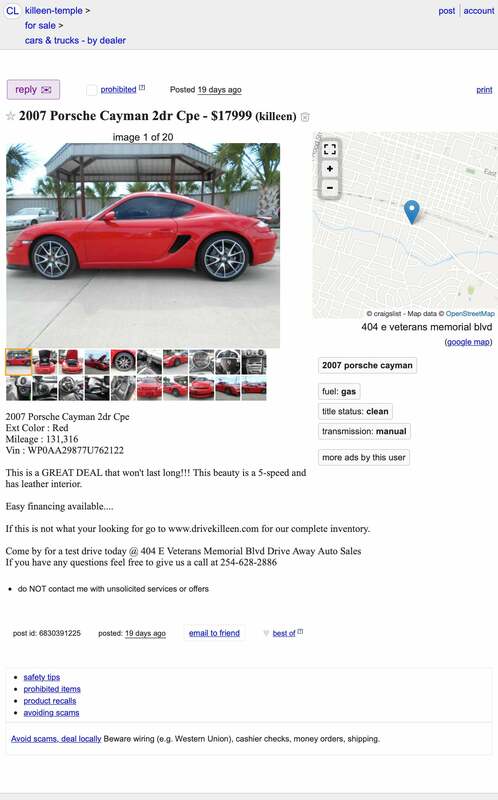 Killeen, TX Craigslist, or go here if the ad disappears. For $12,900, Could This Big-Engine 2000 Porsche Boxster Be Worth Big Bucks?